Extraordinary Ministers for distribution of Holy Communion are properly formed, instructed and commissioned lay persons. They should reflect the cultural diversity of their parish community. These ministers are appointed for a given parish community to aid in the distribution of Holy Communion at Mass and to the sick and homebound when ordinary ministers of Holy Communion are unavailable. EMHC are not to function apart from their parish community. Ordinarily, EMHC do not performs any other liturgical ministry at the Mass at which they serve as an EMHC. When the situation requires, the presider of the Mass may call upon members of the faithful who are not EMHC to aid him in the distribution of Holy Communion on that one occasion. Those called must be Catholics in good standing who are themselves able to receive the Eucharist. As the Church teaches, the bishop is the chief liturgist of his diocese. For this reason, the Rector in the Basilica Minore del Sto. 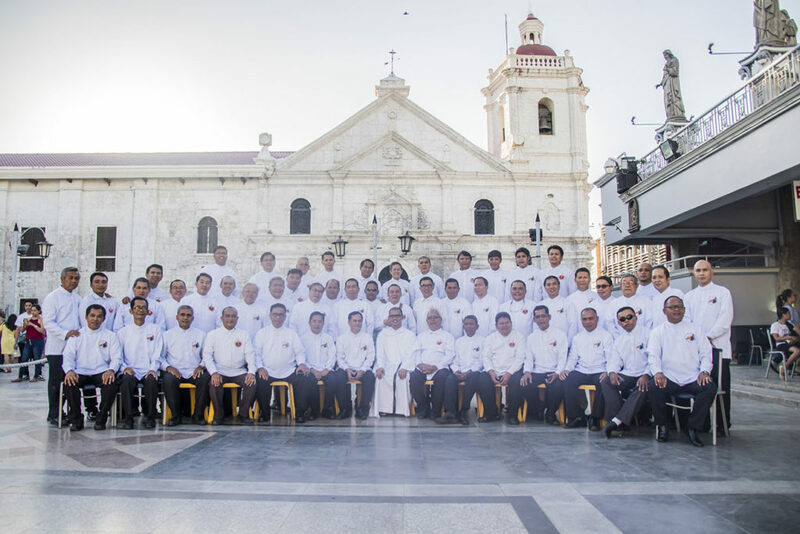 Niño de Cebu, regulates this ministry and all other liturgical ministries. After preparation for this ministry is completed, a formal commissioning of EMHC takes place, normally at a Sunday Eucharit. EMHC are to exercise their ministry in their own parish and at the Basilica Minore del Sto. Niño de Cebu. Since ministry is a call both from God and the community in which it is exercised, it is appropriate that the choice of ministry and renewal of the term of service be mutually agreed upon by the individual and the Basilica Minore del Sto. Niño de Cebu, renewal of EMHC shall be observed on Saturday of August before the feast of St. Augustine. EMHC generally will serve for a period of at least one (1) year, after which time an evaluation should occur. Leave ministry all together at this time. It is helpful that each parish group keep accurate records of each EMHC training, ongoing formation and their term(s) of service. EMHC shot utmost reverence for the Eucharist. This reverence is reflected in their demeanor at Mass (full, active and conscious participation in the liturgy; CSL 13), their attire, and their manner in which they handle the Eucharist. A neat and reverential appearance is in keeping with the EMHC role and belief in the presence of Christ in the Eucharist. The EMHC attire should be appropriate and should not detract from that role. EMHC should retain from using strong cologne, perfume or aftershave because some recipients of Holy Communion have sensitivities to these scents and because these fragrances often remain on one’s hands and can be transferred to the Eucharist. Here in the Basilica Minore del Sto. Niño de Cebu, EMHC wear only white long sleeve barong with logo and a black slacks pants; black shoes; and black socks.